Konrad Group is a leading global digital agency and innovation firm in the enterprise and consumer technology space. Founded by three U of T Computer Science and Engineering graduates in 2008, Konrad provides strategy, design, and development services, with an emphasis on building compelling user experiences. Konrad Group’s digital solutions are being used by more than 50 million consumers in 50 countries. The global agency is continuing to grow their team and currently employs 250+ talented individuals worldwide. We believe that expanding the digital technology industry starts with supporting the next generation of thought leaders. Konrad Group is offering two $2,000 scholarships to third and fourth year Computer Science students. 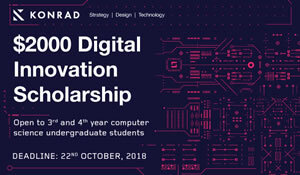 The Digital Innovation Scholarship is open to undergraduate students in the computer science field who are interested in pursuing a career in digital technology. 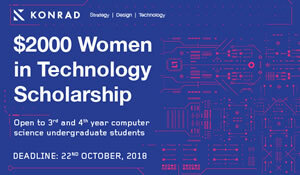 The Women in Technology Scholarship was designed for female undergraduate Computer Science student who’s interested in pursuing a career in digital technology. Applications are due to konrad-award@cs.toronto.edu by October 22, 2018.